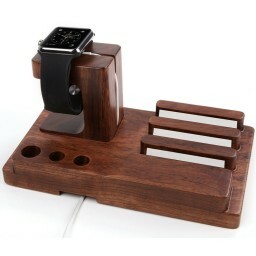 This is 3-in-one stand for holding your Iphone, Ipad and apple smart watch, made up of high quality Rosewood. Stand is very good looking and attractive. It is made by keeping its attractiveness and quality in view. It is sturdy, durable, water resistant and anti-moisture which makes it unique. 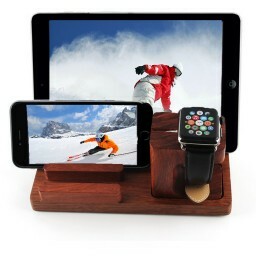 It can hold your Iphone , Iwatch and even other smart phone series very stably. Providing comfortable view and insures safety. 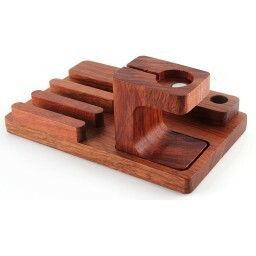 Its durable design makes it differ from others. 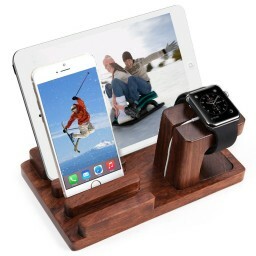 Its soft and processed bamboo wood give you awesome touch feel for the whole holder. Its perfectly fill out corners give you device an extra protection. Its quality and design makes it stands out of the crowd. Its healthier, more comfortable ,simply its better!